The Achilles tendon is a band of tissue that connects the heel bone to the calf muscle of the leg. Injury to the tendon may cause it to become inflamed or torn. Achilles tendonitis is the term used when the tendon is inflamed. The inflammation causes pain at the back of your leg near the heel. A tear of the tendon is called a rupture. It also causes pain near your heel. An Achilles tendon may tear during sudden activity. For example the tendon might tear when you jump or start sprinting. Achilles tendonitis causes pain and may cause swelling over the Achilles tendon. The tendon is tender and may be swollen. You will have pain when you rise up on your toes and pain when you stretch the tendon. The range of motion of your ankle may be limited. When the tendon tears or ruptures, you may feel and hear a pop. 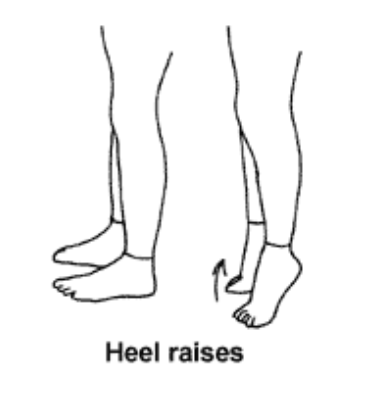 If there is a complete tear, you will be unable to lift your heel off the ground or point your toes. Your health care provider will examine your leg, looking for tenderness and swelling. Your provider will watch your feet when you walk or run to see if you over-pronate. Tests may be ordered to determine the severity of the injury such as an ultrasound or MRI. Put ice packs on the Achilles tendon for 20 to 30 minutes every 3 to 4 hours for the first 2 or 3 days or until the pain goes away. Raise your lower leg on a pillow when you are lying down. Take anti-inflammatory medication as prescribed by your health care provider. If your health care provider prescribes a heel lift insert for your shoe, wear it at least until your tendon heals and possibly longer. The lift prevents extra stretching of your Achilles tendon. While you are recovering from your injury, change your sport or activity to one that does not make your condition worse. For example, you may need to swim instead of run. Do exercises your health care provider gives you to stretch and strengthen your Achillestendon. If you over-pronate, your health care provider may prescribe custom-made shoe inserts, called orthotics, which help keep your foot stable. In some severe cases of Achilles tendonitis, your foot may be put in a cast for several weeks. A tear of the tendon may require surgery. Or your foot may be put in a cast or boot for 6 to 10 weeks. The goal of rehabilitation is to return you to your sport or activity as soon as is safely possible. If you return too soon you may worsen your injury, which could lead to permanent damage. Everyone recovers from injury at a different rate. Return to your activity is determined by how soon your Achilles tendon area recovers, not by how many days or weeks it has been since your injury occurred. In general, the longer you have symptoms before you start treatment, the longer it will take to get better. How can I prevent Achilles tendonitis? The best way to prevent Achilles tendon injury is to stretch your calf muscles and Achilles tendons before exercise. If you have tight Achilles tendons or calf muscles, stretch them twice a day whether or not you are doing any sports activities that day. If you have a tendency to get Achilles tendonitis, avoid running uphill a lot. Written by Pierre Rouzier, M.D., for McKesson Health Solutions LLC. You can do the towel stretch right away. When the towel stretch is too easy, try the standing calf stretch, soleus stretch, and plantar fascia stretch. When you no longer have sharp pain in your calf or tendon, you can do the heel raises, step-up, and static and dynamic balance exercises. • Standing calf stretch: Facing a wall, put your hands against the wall at about eye level. Keep the injured leg back, the uninjured leg forward, and the heel of your injured leg on the floor. Turn your injured foot slightly inward (as if you were pigeon-toed) as you slowly lean into the wall until you feel a stretch in the back of your calf. Hold for 15 to 30 seconds. Repeat 3 times. Do this exercise several times each day. • Standing soleus stretch: Stand facing a wall with your hands at about chest level. With both knees slightly bent and the injured foot back, gently lean into the wall until you feel a stretch in your lower calf. Once again, angle the toes of your injured foot slightly inward and keep your heel down on the floor. Hold this for 15 to 30 seconds. Return to the starting position. Repeat 3 times. • Plantar fascia stretch: Stand with the ball of your injured foot on a stair. Reach for the bottom step with your heel until you feel a stretch in the arch of your foot. Hold this position for 15 to 30 seconds and then relax. Repeat 3 times. • Step-up: Stand with the foot of your injured leg on a support (like a block of wood) 3 to 5 inches high. Keep your other foot flat on the floor. Shift your weight onto the injured leg and straighten the knee as the uninjured leg comes off the floor. Lower your uninjured leg to the floor slowly. Do 3 sets of 10. Place a chair next to your non-injured leg and stand upright. (This will provide you with balance if needed.) Stand on your injured foot. Try to raise the arch of your foot while keeping your toes on the floor. Try to maintain this position and balance on your injured side for 30 seconds. This exercise can be made more difficult by doing it on a piece of foam or a pillow, or with your eyes closed. Stand in the same position as above. Keep your foot in this position and reach forward in front of you with your injured side&#39;s hand, allowing your knee to bend. Repeat this 10 times while maintaining the arch height. This exercise can be made more difficult by reaching farther in front of you. Do 2 sets. Stand in the same position as above. While maintaining your arch height, reach the injured side&#39;s hand across your body toward the chair. The farther you reach, the more challenging the exercise. Do 2 sets of 10.